ARTISSIMA 18, INTERNATIONAL FAIR OF CONTEMPORARY ART, TURIN, ITALY, for the second time under the artistic direction of Francesco Manacorda, runs from 4 to 6 November (a preview was organized on 3 November). Over the years Artissima has made a name for itself in the world of contemporary art, in Italy and around the world, as a leading observatory of the finest research being carried out in the visual arts, and as a great cultural event. Last year, Artissima 17 attracted over 48,000 visitors and 1300 accredited journalists. The international art fair takes place in the spectacular premises of the Oval, an architecturally innovative pavilion with 20,000 m² of naturally lit space made for the Winter Olympic Games of Turin 2006.
o Artissima Main Section includes galleries on the international art scene (45 from Italy and 57 from abroad) chosen by the Selection Committee. o Artissima New Entries features young galleries that have been working for less than five years, and that are taking part in Artissima for the first time, chosen by the Selection Committee. At this 18th edition of Artissima, 25 galleries from 11 different countries (2 from Italy, 23 from abroad) have been admitted. During the fair, an international jury will confer the Guido Carbone Award upon the gallery in the New Entries section that has worked best to discover and promote young artists. o Artissima Present Future, devoted to 16 emerging artists invited by a team of international curators, and presented by their galleries. o Artissima Back to the Future was launched in 2010 with the aim of focusing on artists who worked in the 1960s and ’70s and who have enjoyed little recognition in recent decades, but whose work can be seen as particulary significant today. This is an authentic museum-style exhibition of works by a group of artists chosen by an international Committee. Back to the Future shows 20 artists in 2011. Artissima 18 continues its research into the future scenario of museums, which started up last year with the Casa delle contaminazioni - The House of Contamination. This year the programme consists of two different projects, which are independent and yet inextricably linked one to the other: the first, titled Simple Rational Approximations is on view inside the fair, while the other, Artissima outside, in the evenings only. Both projects concentrate on new models and formats for the production, interpretation and circulation of contemporary art. For the "first time at a fair" (according to the press release), they are curated by artists. At the centre of the Artissima pavilion, Simple Rational Approximations is a project for a museum invented by the Turin-born artist Lara Favaretto working with Francesco Manacorda. The title of the project is taken from a mathematical model that defines an interpolation – in other words, the approximate calculation of values of magnitude using known values – which uses rational functions. An approximation, which derives etymologically from “to come near”, also suggests the underlying theme of the project, which brings together different ideas and attitudes, proposing a fictitious, ephemeral, nomadic organisation that exist only for the four days of the fair. This “provisional institution” is modelled on some of the traditional functions of contemporary art museums – a permanent collection, a temporary exhibition, a bookstore, an auditorium, an educational department, and a storage – rethinking their way of working through a selection of existing projects or new proposals submitted by individuals, collectives, and institutions, who were selected from the international art world for their inventive ability to re-imagine operational and planning methods. For the first time, this year Artissima organises a programme of exhibitions and events in the centre of Turin, outside the fair and outside of its opening hours. In the mediaeval district of the “Roman Quadrilateral”, a number of not-for-profit spaces run by artists from all over Italy are temporarily move out to a series of city spaces, where they work on their various experimental activities, at the same time and in the same place. The project intends to create a network of spaces and collectives that are often the only organisations that actively promote artistic experimentation in their areas. The aim is to put the international spotlight on a relatively unknown aspect of Italy and of its hidden artistic scene. Imagined as a group exhibition of experimental spaces, ARTISSIMA LIDO is curated by three Italian artists, Christian Frosi, Renato Leotta, and Diego Perrone, and it offers a very full, varied calendar of exhibitions, performances, screenings, concerts, and conversations in specially chosen places. ARTISSIMA LIDO's special catalogue was published in collaboration with UniCredit Studio, contain texts by the curators, illustrations, and information about the collectives taking part in the event. Consistent with the Artissima communication project, this year an ‘Annual Report’ will bring together the texts, essays, images, and statistics about the galleries and the various sections, as well as about the curatorial projects and the events at the Fair and at other venues in Turin. Artissima 18 is going onto a multimedia platform for the first time in collaboration with Mousse Magazine. 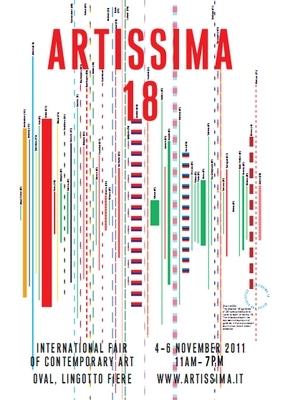 Full information about Artissima 18 are available for the iPhone and iPad. The application is completely free of charge.